In the year 2000, Jim Andrews went through a significant retooling by shifting to Macromedia Director— an authoring tool that publishes content to the Web in Shockwave format, still easily accessible through its browser plugin. One of the benefits of Director was that it gave him a powerful set of tools to work with audio, allowing him to return to an early passion for radio and audio that led him to become a poet who engages media. 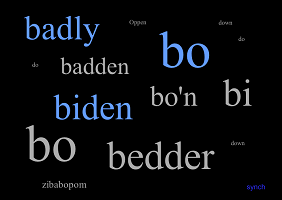 “Oppen Do Down” is one of his sound-centered poems (what he calls “vismu”) and it is full of his voice: recorded, shaped, looped, attached to verbal objects, and presented to reader/listeners to select, combine, stack, and enjoy. For a close reading/listening of this piece and other vismu pieces, such as “Nio,” read the section titled “Visual Music” in my dissertation (pgs. 207-244).